So during our 3 day weekend stay in Cape Cod, we had dinner twice at Fresh Ketch. 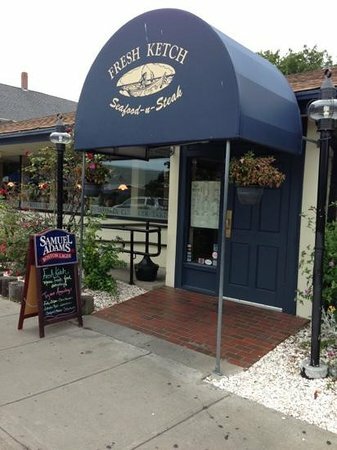 Seeing as how our trip was short, we probably should have tried a different restaurant but we really enjoyed our first dinner at Fresh Ketch the first night. And after a tiring second day, we didn’t want any (bad) surprises so we decided to hit Fresh Ketch again. Although a popular spot as it’s right on Main Street, we had no problem getting seated as soon as walked in at 7:30 pm on a Friday night. The menu is full of seafood as you can imagine with a variety of meat dishes too but we focus on seafood. 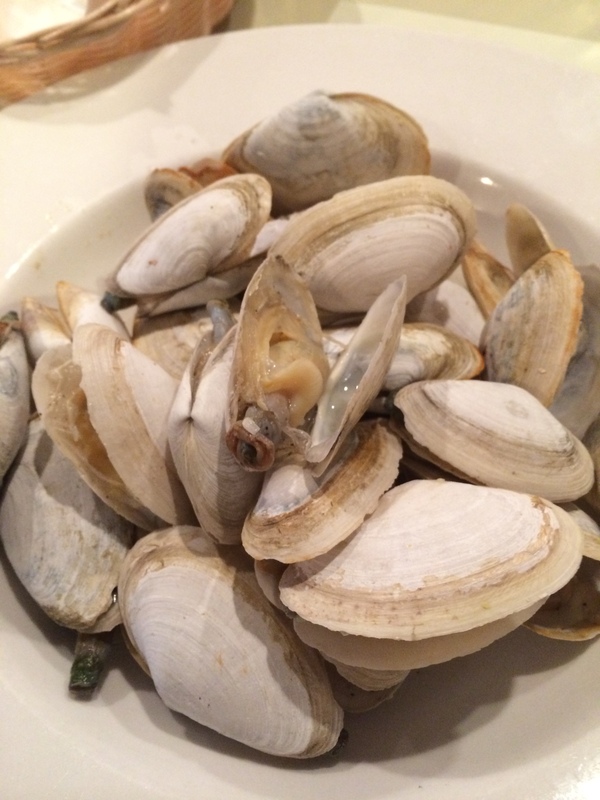 We had the Cape Cod Steamers ($11.99 for 1 lb). This was pretty good in terms of flavor but there was the drawback of it being a bit gritty. If you really can’t stand that, then do not get the clams it would seem this is not a one-off since the clams we had in the Clambake on our second night was also gritty. 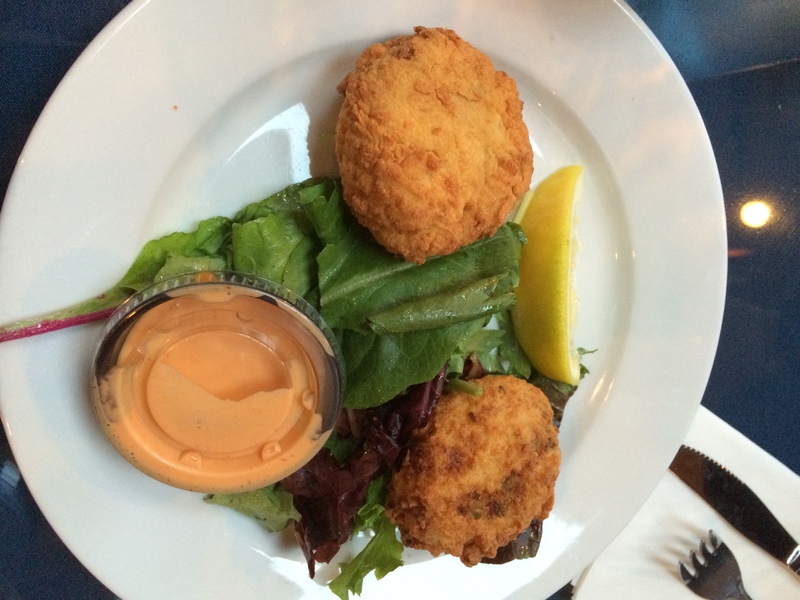 We also tried the Lump Crabcakes ($9.99). 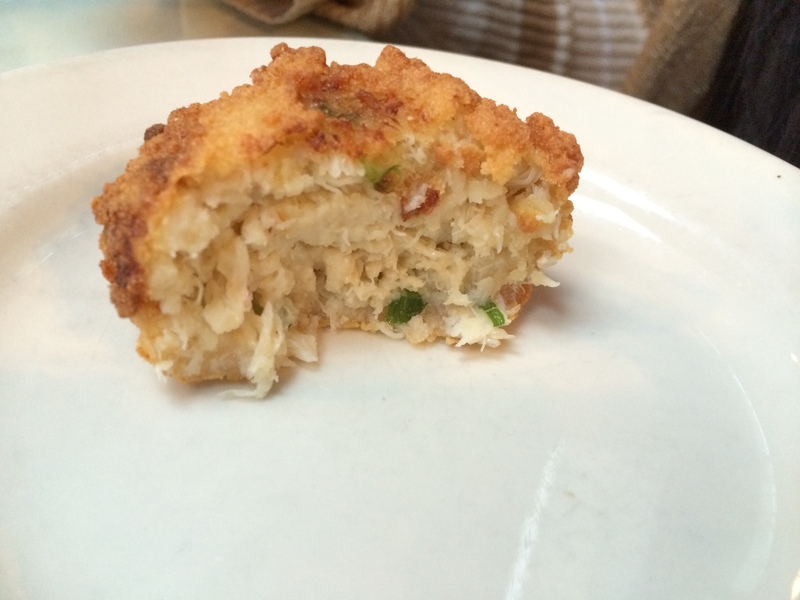 This was decent; there was a good amount of sweet crabmeat so the cake was not just filler. Wish they had either made them bigger or given a 3rd cake as the portion was a bit small. We also tried the New England Clam Chowder ($4.99 a cup) and Lobster Bisque ($5.99 a cup). 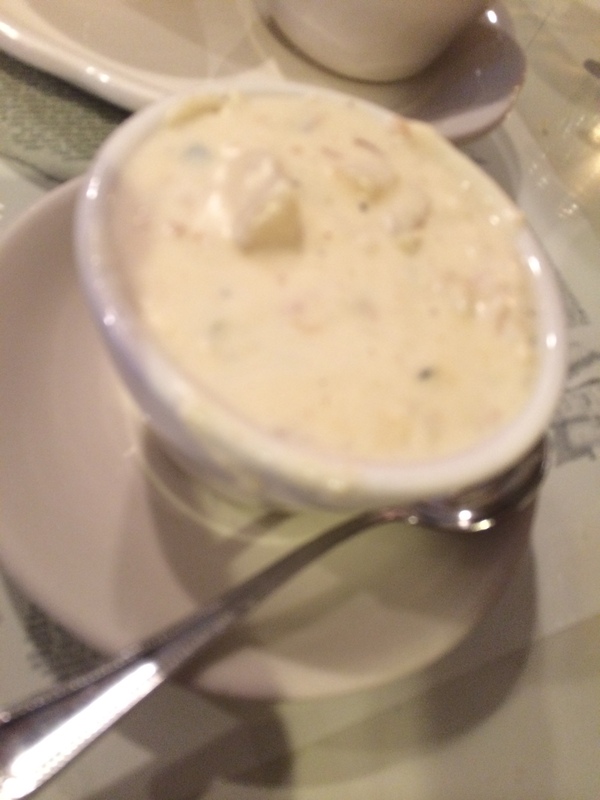 I loved the clam chowder. 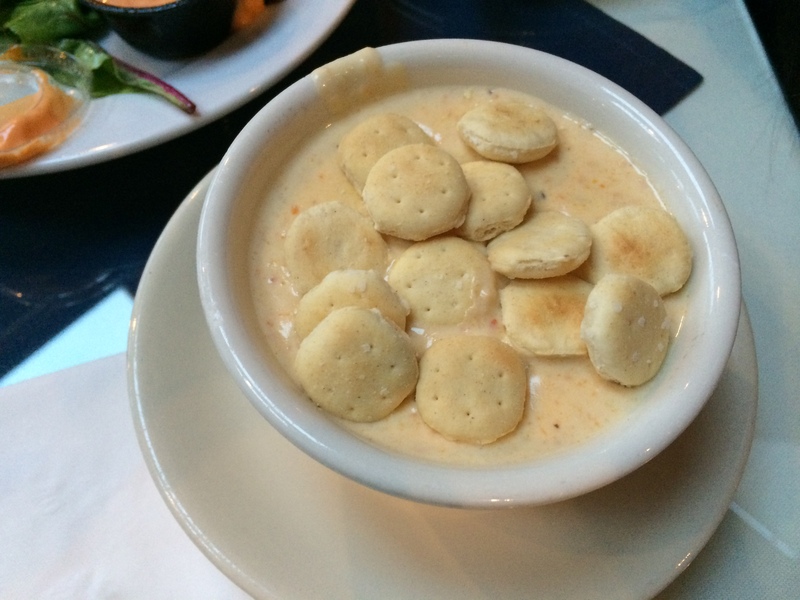 It was thick and creamy the way I like it and chock full of clams and potatoes. The lobster bisque was ok. As I’m not a huge fan of lobster bisque in general, I don’t have much of an opinion on this. I will say it was pretty flavorful but given the choice I would pick the clam chowder over the bisque any day. It was apparently all about the clams for us as we also tried the Fried Clam Strips ($13.99). The batter was not too much and kept on well and had good seasoning. The strips themselves seemed fresh and not of the frozen variety. It was fried well, not overly greasy. All in all, a dish I would not mind ordering again. 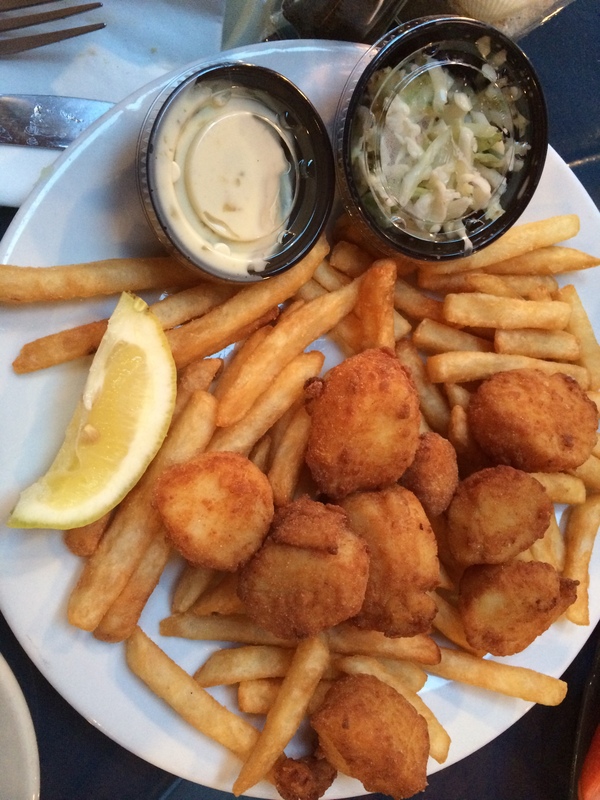 There was also Fried Scallops ($19.99) to be sampled. I only tried a bite of it, it was fine. J seemed to enjoy it well enough. J also had Linguini Clams ($18.99) the first night. 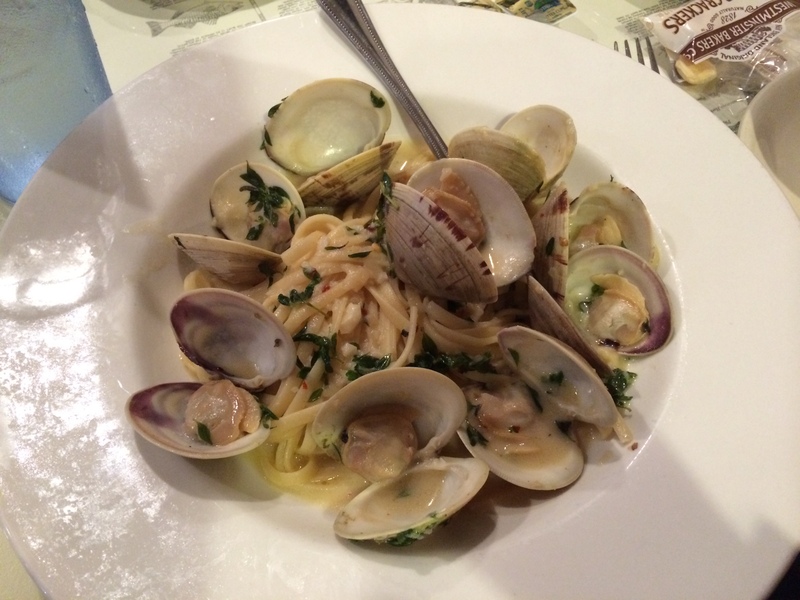 He enjoyed the littleneck clams in a white wine sauce over linguini. I tried a bit of the pasta, it was well cooked. I’m not a big fan of white wine sauce though. The portion was ok if you had a decent amount of appetizers but would be considered on the small side if you are really hungry. 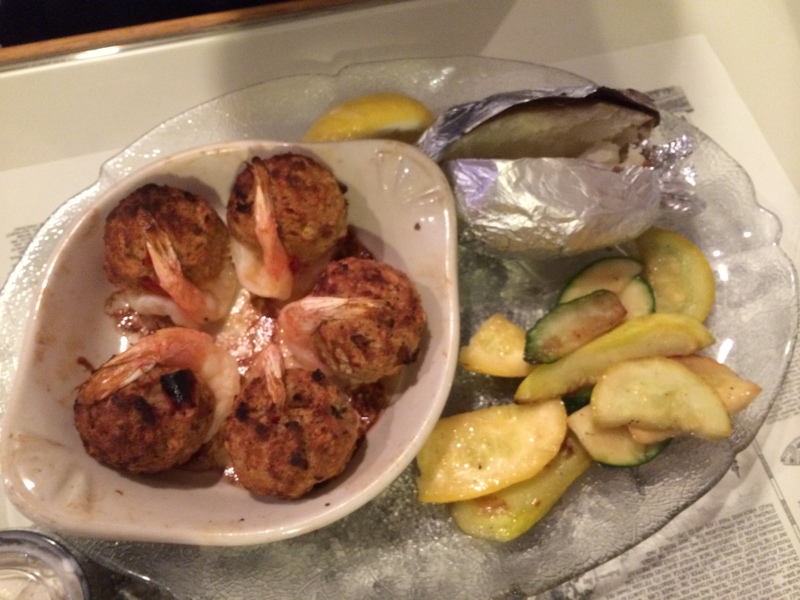 LJ had the Baked Stuffed Shrimp ($19.99) which was 5 (normal sized though the menu claims jumbo sized) shrimp stuffed with a seafood stuffing with a baked potato side and some veggies. I tried a piece of the shrimp but didn’t find it particularly delicious or exciting. 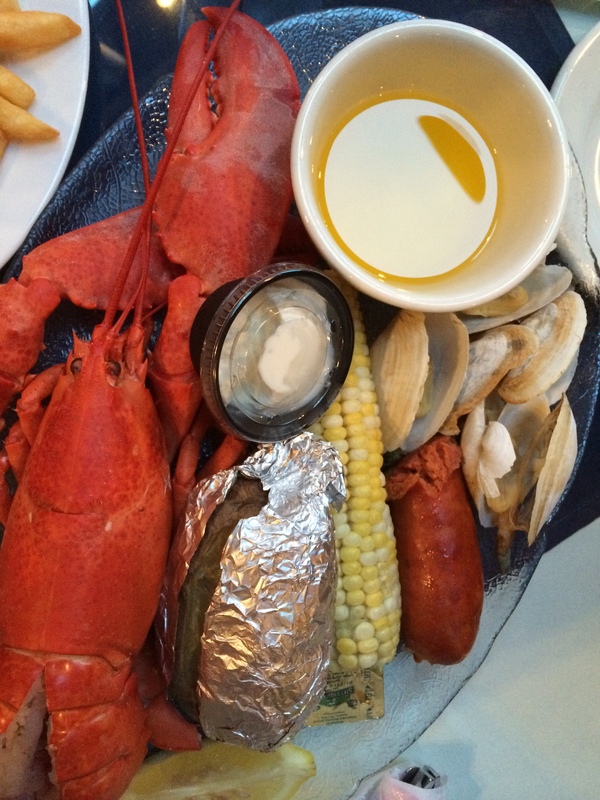 We had to try lobster in Cape Cod, so we got the Clambake ($35.99) which included a 1.25 lb lobster, steamers, baked potato, corn on the cob, and smoked chorizo. I have to say it was a bit of a letdown. The lobster was fine but nothing spectacular. I think I actually like the Cantonese way of cooking lobster (Cantonese Style Lobster) than just having it plainly steamed and dipped in butter. The lobster meat was kind of tough and the whole dish just fell flat for me. Overall though, we enjoyed the food at Fresh Ketch and the service was great (better and more friendly the first night but still efficient the second night). The restaurant is right on Main St and seems to be quite popular but there was no wait either nights. They also have a great al fresco dining area. It’s a great place to try if you’re ever in Cape Cod. We often do that too! If somewhere is really good on the first night, we’re always tempted to “play it safe” and go back the second night! The food looks delicious! if it ain’t broke.. 😉 we tend to go back to same places but try different dishes. the clam chowder looks delicious and i just really want to eat those fried clam strips, all the photos look very appetizing!! and there menu so many options would love to have a meal there! Fried clam strips sounds amazing! You make it look amazing too. Thanks. 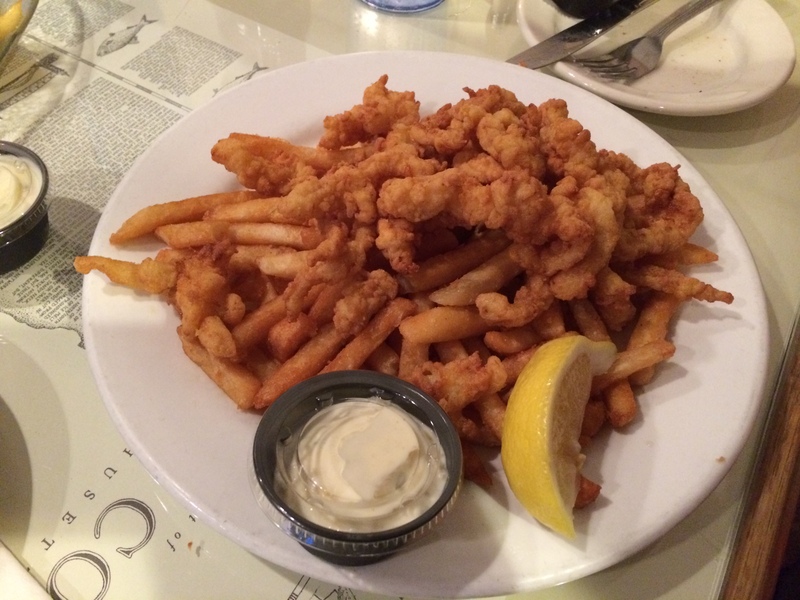 I don’t see fried clam strips on NY menus much so I knew I had to get them and try it out. They’re awesome as long as its not overcooked. This looks absolutely delicious! Now my stomach is grumbling for some seafood. I can always go for seafood anytime. I prefer asian style seafood, too (Im half asian)- but this post made me drool!